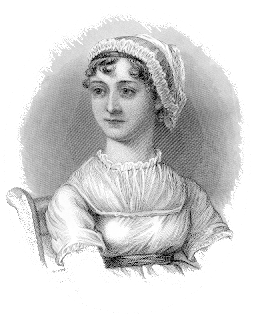 Our December observance of Jane Austen's birthday was postponed this year due to a rather nasty snow storm. (One that would make even Mr John Knightley tremble!) However, the promise of cake lured us once again to our favorite meeting place, the Solon Library, for a belated birthday celebration and a fabulous presentation on Sense & Sensibility by member Charla Coatoam. Unlike Marianne, we were able to temper our passions and wait until the discussion was over to pounce on the refreshment table. We thoroughly enjoyed the conversation - topics ranged from the different temperaments of the sisters to the scandalous behavior of Mr Willoughby. We were divided in our opinions of Marianne as a spoiled child, or as a misunderstood teenager; however, there was not one among us willing to give Willoughby more of a break than to admit that he was most likely not the worst offender among the gentlemen of his class. The birthday toast was made with the traditional sparkling grape juice and eloquent remembrance by our RC, Pat Fernberg. Our RC Pat Fernberg (second from left) gives her toast to Jane Austen. Listening to Pat's wonderful toast to our favorite author.